I don't understand. I have Rift, the special version of 1.13.2, but the file is a .litemod file. It doesn't work. I don't know why but after a month my Minecraft runs out of Memory using Voxelmap, after I joined a World again it works but the map has a Blackscreen. My Java is still updated but what can I do else? 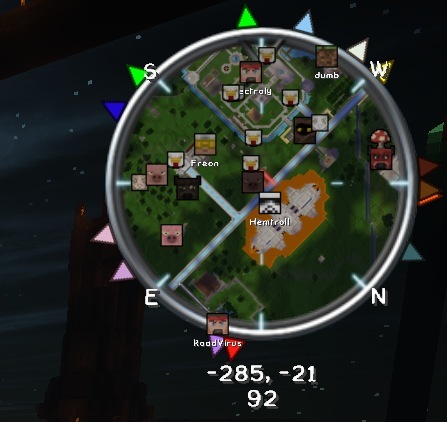 I see to have a problem where it wont save my waypoints or explored map area when i leave a server. I am using the rift 1.13.2 version. I am also having this same issue when i use realms servers on 1.13.2 version. Were you ever able to figure out how to fix it. How would I add custom icons for multiple mobs that use the same class? Nice mod! How do I remove the highlight? How do I remove the Multiworld... function? My friends and I all love this mod (running 1.13-whatever latest version), but we've been having an issue in Realms, where the data does not save from day to day. If I log out of Minecraft, and back in again some time later, all my waypoints and any map I've uncovered is reset, and nothing is left. Not sure why we're having this issue? Older versions that used Forge, while we were on Realms, never had that issue. A server I've been playing on has recently changed IP's while it updated to 1.13.2 and I'm trying to move the map data over. Changing the name of the folder and waypoints file ports the waypoints but doesn't seem to port the map despite all the files being in the folder. I have a question Can you also do for forge versions? I'm enjoying this mod. My only opinion is that I wish a "simplified color picker" option existed. I don't believe anyone really needs the full spectrum of color picking. I'd be more satisfied with 16 or 32 color options. Is there any way to easily override the color picker PNG file that is used (outside of unpacking the JAR)? Im with you on this one, very OCD when it comes to colour coding I just end up editing the file after so colours match but would like a set of 16 or 32 that i just just select or at the function to input your own RGB figures in the GUI.